Three mixed martial artists fighting under the Team Lakay banner brought home the bacon in their respective bouts last night (July 27) at a One Championship event dubbed Reign of Kings. In front of an enthusiastic hometown crowd at the Mall of Asia Arena in Pasay City, Joshua Pacio, Eduard Folayang, and Kevin Belingon dispatched their opponents with patience and precision. When the dust settled, two of them (Pacio and Folayang) are a step closer to challenging for the belt in their respective divisions. One of them (Belingon) had the glittering One Championship interim bantamweight strap wrapped around his waist. Twas a perfect night for the highland warriors. Pacio, the first Team Lakay fighter to enter the cage that night, fought like he needed to catch an early bus to get back home. He finished the previously undefeated Pongsiri Mitsatit in the very first round of a scheduled three-rounder. An ill-timed kick by the Thai prospect gave Pacio the opportunity to take the fight to the ground. Pacio worked his way to full mount and unleashed a flurry of ground and pound. Mitsatit made his second mistake in the fight by giving up his back. Pacio saw an opportunity, secured a reverse arm lock, and it was all over. With three straight wins, Pacio has made it clear that he’s ready to take another crack at Yoshitaka Naito, the Japanese veteran who currently holds the One Championship strawweight belt. Pacio first challenged Naito for the title back in October of 2016. He got submitted in the third round. 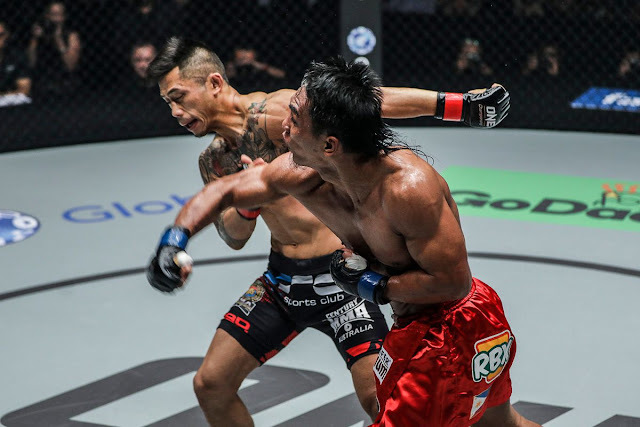 Folayang emerged victorious with a unanimous decision win over Aziz Pahrudinov, an undefeated fighter who was making his promotional debut in One Championship. It was a very close fight and each fighter had his moments. It boils down to which particular attack gets more merit. Folayang’s leg kicks or Pahrudinov’s takedowns. In the end, Folayang earned the nods of the judges. This is Folayang’s second win after losing the lightweight belt to Martin Nguyen last year. In the main event, Belingon finally struck gold when he engaged Martin Nguyen in a technical fight. Belingon breezed through the rounds with ease. He was never put in any danger. He had answers to all of Nguyen’s attacks even in the later rounds when a clearly frustrated Nguyen went desperately for takedowns. Belingon stuffed the takedown attempts and delivered his own brand of violence whenever Nguyen got close enough. Belingon mixed it up with his signature kicks, improved boxing, and a takedown defense that seems to get better every fight. With the victory, Belingon was crowned as the interim One Championship bantamweight champion. He still has one hurdle to go through before he can be proclaimed as the best in the division. And that’s Bibiano Fernandez. Fernandez has been sidelined due to an injury. Thus explains the interim belt awarded to Belingon. If the two combatants ever face again, it would be a rematch. Belingon first challenged Fernandez for the title back in January of 2016. He was submitted by the Brazilian in the first round. The Belingon-Nguyen bout was only for the interim bantamweight title. This means, Nguyen still remains as the lightweight and featherweight champion.